For The People’s Critic, perhaps the most anticipated moment of any cinematic calendar year is not the summer blockbusters or the fall awards-hungry films. It is the release of the latest Woody Allen film. With Blue Jasmine being his 41st film as writer/director in as many years, the always reliable, always prolific auteur has earned the respect of The People’s Critic as a living legend. The Brooklyn-born neurotic genius shows no signs of running out of steam at the age of 77 with Blue Jasmine being one of his most insightful and finely-tuned films of his career. Have you ever wondered who that blabbering stranger is who sits next to you on an air plane or who that mumbling nut-case is who sits next to you on a park bench? These are quite possibly the questions that inspired Allen’s latest film. The film’s title refers to Jasmine French (Cate Blanchett), a modern American socialite who suffers a life crisis when her financial investor husband, Hal (Alec Baldwin), turns out to be a white-collar crook in the vein of Bernie Madoff. Jasmine’s story is told as a fractured storyline flashing back and forth to Jasmine’s life before and after her impending ruin. Allen handles these juxtapositions flawlessly, carefully crafting the triggers that send the story hurdling back and forth. Furthermore, trust is a dynamic issue presented in the film. While mostly known for his impeccable ability to create fascinating female characters (and Blue Jasmine is no exception), Allen also presents the damage of deception through his uncharacteristically diverse set of male characters. Bobby Cannavale is especially indicative of this as Ginger’s current boyfriend, Chili. Michael Stuhlbarg, Louis C.K., and Peter Sarsgaard join Cannavale and Dice Clay in developing the vital effect of trust, or lack thereof, on the human condition. 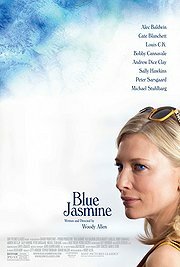 Blue Jasmine is rated PG-13 and has a running time of 1 hour and 38 minutes. This is another solid film in Allen’s storied career that is sure to illicit emotion while also emitting a slightly disturbing tone.